It has become impossible to imagine our culture without advertising. But how and why did advertising become a determiner of our self-image? Advertising the American Dream looks carefully at the two decades when advertising discovered striking new ways to play on our anxieties and to promise solace for the masses. 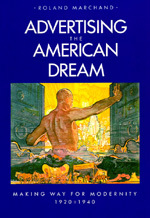 As American society became more urban, more complex, and more dominated by massive bureaucracies, the old American Dream seemed threatened. Advertisers may only have dimly perceived the profound transformations America was experiencing. However, the advertising they created is a wonderfully graphic record of the underlying assumptions and changing values in American culture. With extensive reference to the popular media—radio broadcasts, confession magazines, and tabloid newspapers—Professor Marchand describes how advertisers manipulated modern art and photography to promote an enduring "consumption ethic." Roland Marchand (1933-1997) was Professor of History at the University of California, Davis, and authored numerous works on American cultural history.